Located on the pristine Long Island, known for its contrasting coastline of limestone cliffs and tranquil beaches, Port St. George is taking a major step toward operating entirely off-grid through extensive use of solar tiles and storage batteries. The mixed-use development will be designed for those seeking an experience characterized by an authentic Bahamian environment, luxurious, modern amenities and an eco-friendly lifestyle. Port St. George will exemplify the next evolution of luxury destinations, as eco-engineering and future-proofing are being incorporated into every aspect of the project. Studio Hillier developed the site plan for Port St. George and is bringing forth the project’s commercial and residential architecture. Studio Hillier and Star Resort Group Inc. are collaborating with a shared passion for design that will be environmentally sustainable. An organic hydroponics farm will provide fresh fruits and vegetables, reducing the need for imported products. Food waste will be distributed directly to a composting center, which will reduce waste and create a product for soil enrichment. Rainwater will be collected in cisterns and a solar-powered, reverse-osmosis desalinization plant will convert seawater into fresh, drinkable water for the development. Port St. George will span the two-and-a-quarter-mile width of Long Island, with 4,200 feet of untouched shoreline on the ‘Caribbean side’s’ Exuma Sound and 2,000 feet of Atlantic Ocean frontage, constituting a total of 882 acres. The development will include various real estate offerings, comprising 515 luxury residences; a five-star hotel and spa; a 640-berth marina; a yacht club; an attractive harbor-front commercial area; an ocean beach club; a lighthouse; several first-class sports facilities and an array of culinary options. The 640-berth marina, sheltered by the protected harbor, will be the largest in The Bahamas. The one-mile arc of the waterfront will be home to both residential and commercial buildings, serving as a bustling village center for residents, resort guests, and local Bahamians. The area will feature a yacht club, a market, a culinary school and a variety of food and beverage venues, including a lighthouse with a bar and cafe at the harbor inlet. Port St. George will be accessible by both commercial and private aircraft via Stella Maris International Airport, which has a port of entry status and is five minutes from the development. 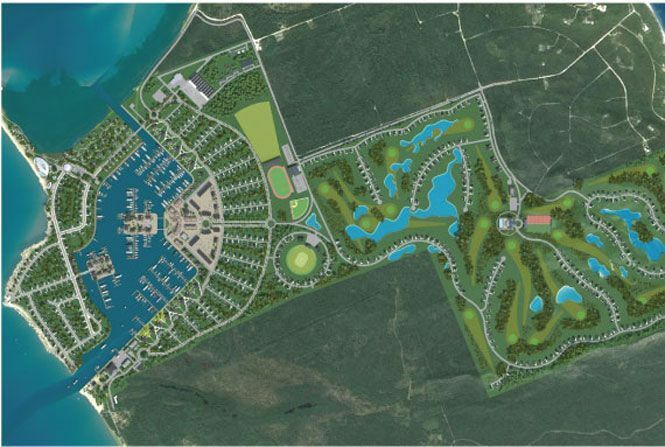 In a comprehensive market analysis by Ragatz Associates, renowned industry specialist, Richard Ragatz found that due to a strong resort-residential real estate market throughout The Bahamas, limited competition and apparent untapped markets in specific price levels, this is the prime time for the development of Port St. George. The report highlights the mix of hotel, marina, golf course, and extensive amenities as being an especially attractive and proven concept.